If you’ve been watching the Ohio House of Representatives pick their new Speaker, you already know it has been a dazzling display of discord. Representatives Ryan Smith, Larry Householder, Andy Thompson and others have been battling it out, each side claiming foul as they all look to shore up the votes they need to grab the gavel. 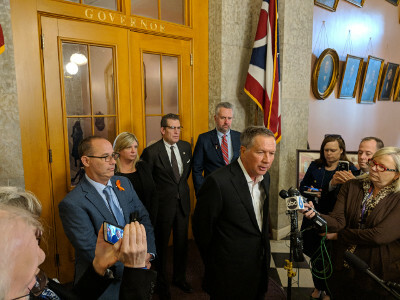 But while this distraction has been front and center on Ohio’s political stage, Kasich’s treacherous gun-control bill (HB585) has been steadily making its way through the process! You see, Kasich isn’t about to let this “distraction” (of who will be the next speaker) go to waste. In fact, he’s deployed his legislative liasons to browbeat the members of the House State and Local Government Committee into submission, trying to bend them into passing HB585 out of committee while nobody is watching. That’s why we can’t let up the pressure – not even for a minute. ➥ Destroy due process for gun owners and bastardize the American principle of “innocent until proven guilty” by creating secret, star-chamber hearings where an accused gun owner isn’t even allowed to be present to offer a defense before his Second Amendment Rights are stripped away. We’ve heard some horror stories about these secret hearings, but one thing we know for sure is that when the accuser is the only one in the room, the judge virtually always issues the order! ➥ Ban bumpstocks and rubber bands in the state of Ohio. But under the new definition on page 46 of HB 585, a “bump stock” would be a “machinegun” because it allows an AR-15 to fire multiple times with the single PULL of a trigger. This is true even though the current federal and Ohio definition rely on the single FUNCTION of a trigger. That’s right, by using a bump stock, the trigger FUNCTIONS every time a round is discharged, even though the finger only pulls once. So HB 585 would set the stage for saying that a semi-automatic fires automatically. As such, an AR-15 would become the “assault rifle” which gun-grabbers have falsely claimed it to be. Let’s say a President Corey Booker, President Joe Biden or President Elizabeth Warren used the recent Trump “bump stock” regs to ban all semi-automatic rifles, including AR-15’s. They would do that on the basis of the fact that, once “bump stocks” are defined as “machineguns,” then all AR-15’s can now “readily restored” or “converted” into “machineguns” by adding a “bump stock” (and this makes the AR-15 itself a “machinegun” under 26 U.S.C. 5845(b)). Gun Owners of America would immediately challenge the President Booker or Warren or Biden AR-15 ban, and we expect that GOA could get the D.C. Court of Appeals to stay the ban until the case had worked its way up to the Supreme Court. In the meantime, however, Ohio would be “joined at the navel” to the challenged federal ban. Throw another school shooting into the mix and it’s possible and likely that Ohio would be able — or even required — to confiscate all AR-15’s and other semi-automatic rifles while the federal ban was being appealed. John Kasich knows all this, and he’s working hard to browbeat enough legislators to drum up the votes he needs to land it on his desk for signing. That’s why we need you to take action! Help us stop it by contacting your state representative and demand they publicly oppose, block in committee and vote NO on HB585. With summer upon us, the gun grabbers are counting on gun owners to get distracted. Don’t let them win – contact your representative NOW and demand they OPPOSE HB585! P.S. Governor John Kasich is using every opportunity to his advantage to try to browbeat enough votes to pass his sweeping gun-control bill, HB585. With summer upon us and the fight over who will become Speaker serving as a distraction, we can’t lose our focus and let them sneak HB585 into law! Help STOP it by contacting your state representative and demand they publicly oppose, block in committee and vote NO on HB585.